Most pet owners have heard of ear mites and are aware that they are a fairly common parasite among cats and dogs. Unfortunately, there are a lot of misconceptions among pet owners regarding ear mites. Below is a series of commonly asked questions written to hopefully correct some of those misconceptions. Ear mites are microscopic infectious organisms closely resembling small ticks. To the naked eye, they will appear as a small white dot. Mites primarily live in the ear canal, and feed off of skin debris. How are Ear Mites diagnosed? Your veterinarian can take a swab of the ear and look for these organisms while examining the swab under the microscope. Confirming the presence of the mites is necessary to distinguish ear mites from other ear infections. What species can be affected? Both cats and dogs can contract ear mites, however it is more commonly seen in cats. 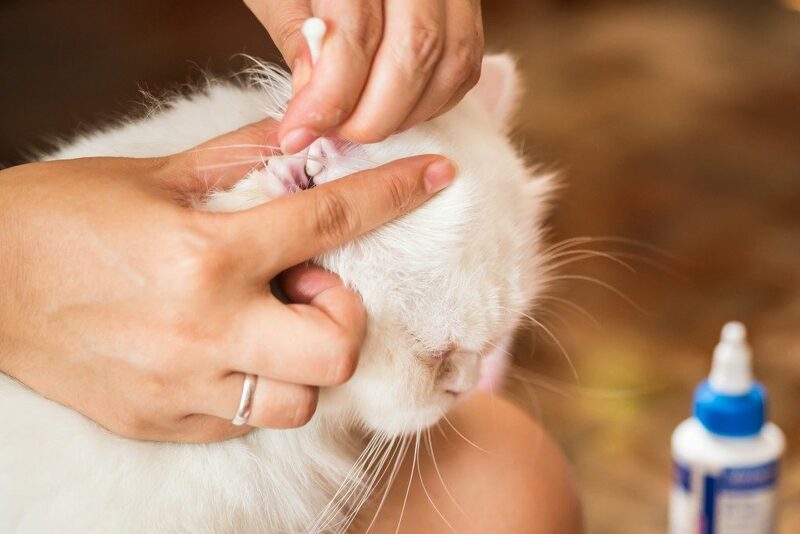 Symptoms of ear mites can include but are not limited to; head shaking or scratching, and dry black-looking ear discharge, which can be made up of ear wax, blood, inflammatory biochemicals and ear mites themselves. How do pets get Ear Mites? Ear mites are easily transmitted through physical contact. They will come from an animal your pet has come into contact with. Because ear mites are so easily transferrable, it is important to treat all household pets in order to completely get rid of them. At our clinic, ear mites are typically treated with a topical medication that is placed on the skin between a pet’s shoulder blades. The two most common medications we use are called Revolution and Advantage Multi. These products also help control fleas and intestinal worms. Each product is a simple one-time application. There are also products that are applied directly into the ear canal, but are not typically used at Morinville Vet Clinic. Can my other pets and/or I get ear mites too? It is highly unlikely for humans to be affected long term by ear mites. Ear mites do not survive for long on a human body. There have been reports in a few cases of pet owners developing a rash due to mites. However, ear mites are highly contagious between pets.